There is something so charming and magical about a Winter Wedding. 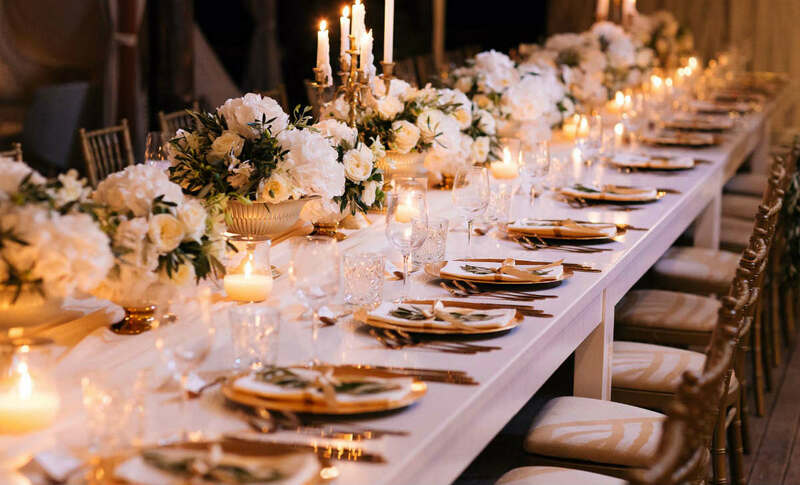 Perhaps it is the glowing decor, the strong desire to cuddle up to your loved ones and the fact that your wedding is not just one of a hundred others being held in the same month, as is the case in summer. It is the best time for you and your guests to glam it up since there is no concern about the sweltering heat, and, let us face it, tuxedos and gowns were made for indoor winter functions. The weather also allows you the pleasure of turning your wedding reception into an intimate, cheerful and heart-warming event that will have everyone smiling and celebrating in no time at all. 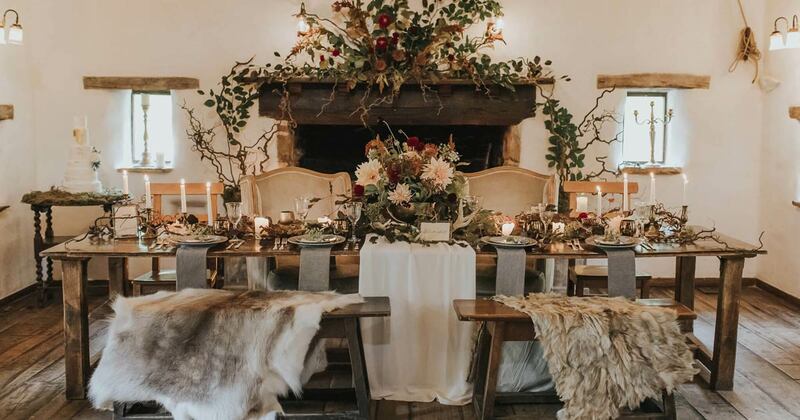 Here are a few ideas to help you incorporate more layers of warmth to your winter wedding that will keep you and your guests rosy and cosy. As soon as your guests arrive at the reception hall, you might offer them a comforting shawl to wrap themselves up in while they recover from their cold journey. You might also like to offer them an umbrella with your names printed on as the party dies down and they consider braving the chilly weather to return home. These are the kinds of things that will have guests talking as they will love the careful consideration you put into taking care of them, and they can hold onto these thoughtful party favours to use throughout the season. 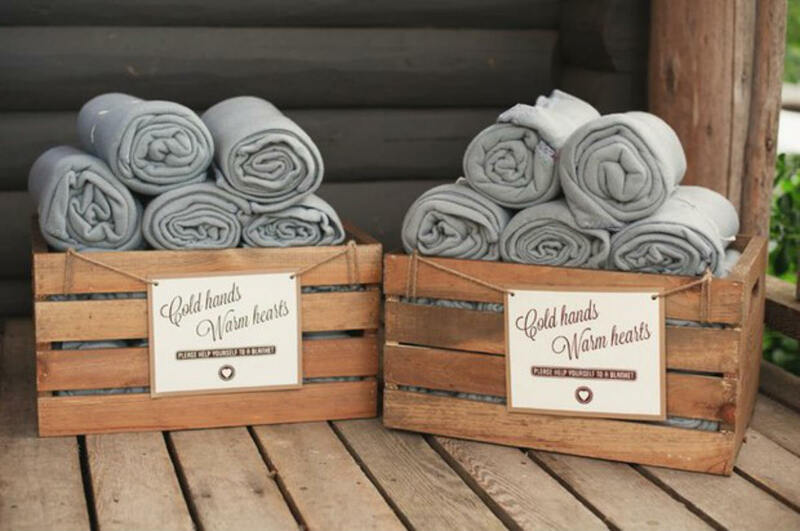 Other ideas range from blankets to mittens, rain ponchos to beanies – the options are endless. In order to create a warm and inviting space for your guests to enjoy, consider filling the place with scented candles. You could pick a scent that warms the soul as well as enjoys the romantic and cosy ambience that their yellow glow generates. Be sure to cover the flames with protective glass, or place them somewhere where they wouldn’t get knocked down, especially if there are going to be children (or rowdy adults) around. 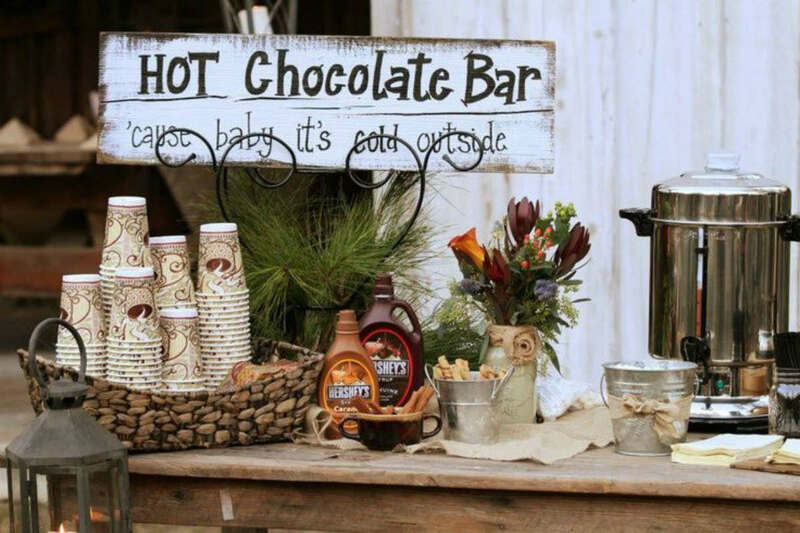 Yes, Summer allows us to set up Mojito bars, but what could be sweeter than a Hot Chocolate Bar with different flavours to choose from? It’s an innovative idea that your guests will be gushing over and queuing up for in a heartbeat. This treat is something guests of all ages can enjoy and will definitely appreciate. Dedicate a good portion of the reception hall to soft loveseats and oversized armchairs. Overload them with cushions, too, to ensure maximum cuddle factor for your guests. This kind of seating area should be an inviting and intimate space where people can cuddle up, chat and enjoy their soothing drinks. It might seem obvious to us that serving cold salads is not exactly fitting for the winter months, but many people stop there when classifying what dishes are not appropriate. A great tip to help you select a menu that suits the time is by going on what fresh produce is naturally in season locally. Serve up thickened soups and hearty dishes that will have you and your guests thoroughly satisfied. A reception hall with a charming fireplace is definitely what you are tracking down for your lovely winter wedding. It is all well and good to have heaters pumping hot air into the room, but the glow of a fire is what heats up your bones. You could set up a cosy lounge area around the fire for your guests, equipped with knitted blankets, of course! Ask for a fireplace screen to prevent any accidents and keep your mind at rest. When discussing your colour scheme with your partner, consider the weather. Colour could have a powerful effect on the atmosphere and sense of warmth one feels as soon as they walk into the room. Colours like burgundy, plum or sage green might be able to guide you to the creation of your cosy and serene bubble of love and celebration. Use the colours in the floral arrangements, table centrepieces, even the bridal party attire. All of these features will come together and contribute to the atmosphere. Our grandparents have long been trying to educate us on the wisdom of drinking whiskey in winter, and now is the time to heed their advice. The issue is that whiskey is an acquired taste, one that not everyone has learnt to enjoy. Be creative with some cocktail ideas to disguise the flavour that will have your guests heated up in no time, or harness the healing power of a Hot Toddy that will take the chill off of Olaf the snowman himself! Stock up on other dark liquor options, such as rum, cognac, or scotch to open up a whole new realm of possibilities for your guests. Dessert is something many of us look forward to at any function, and, oh, the fun you can have with winter treats, flavours and textures. You could serve a decadent chocolate fondant, sticky toffee pudding, or – for a more modern idea – churros with warm, melted chocolate drizzled on top. What fussy foodie would not be satisfied with any of these delicious options? 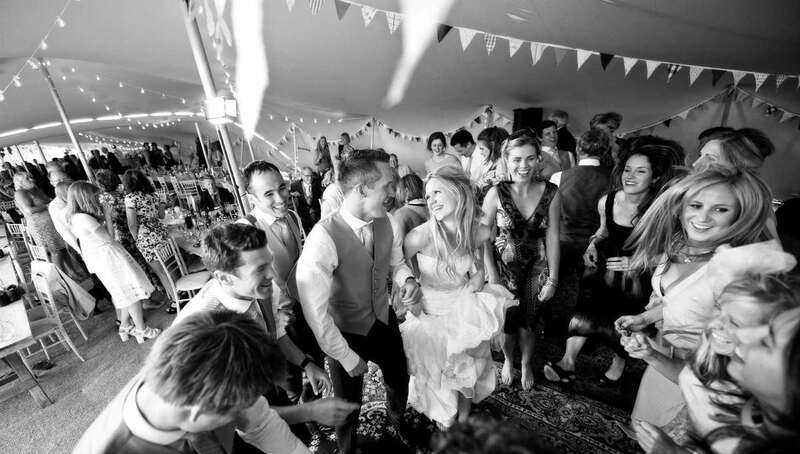 Encourage your guests to generate their own heat by setting up the venue to be conducive to a dancing vibe. Keep the dancefloor clear, get a young, lively band, and welcome every single guest with a drink to loosen them up as quickly as possible. Some other clever tips include serving food in small portions to give your guests enough time to boogie in between courses. Be sure to inform your band of this eating schedule so they can time their set accordingly – play the ballads while everyone is refuelling and the upbeat tracks when they are back on their feet.